Lest readers things that I only like to eat meat (and by meat, I mean, of course, pork) I’m dedicating today’s post to one of my favorite cusines: South Indian. After a recent crash course in using a Sumeet mixer-grinder, Ramach and Vidya introduced me to one of their standby eateries. I had planned to make my way back up 880 to Fremont for some good Indian eats, but Vidya assured me that a detour to Sunnyvale would be worth my time. Never to turn down a personal introduction to food, I postponed a few more rounds of pani puri for a plate of endless rice. As with many Indian restaurants, our destination was ensconced in a strip mall alongside a Korean market, Chinese noodle shop, and Hindi video store. Komala Vilas is nothing fancy. Like its website, it offers only the essentials. There’s not an extensive menu that includes every region of the subcontinent, nor are there evocative artifacts on the walls. If your skin is pale, you might be the only one of your kind in the dining room. Expect families on the weekends and high-tech workers during the weekday lunch rush. But for experiencing a delicious meal as its enjoyed toward the tip of India, you can’t find much better. 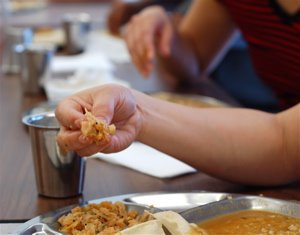 A formal South Indian meal is divided into three courses of rice. Before stainless steel became widespread, banana leaves were the plate of choice, and if you travel in India, you’ll still see this very convenient, very natural form of disposable dinnerware. With purity of service being so important, these one-use plates, bowls and cups were standard. It also helps that the plants are incredibly abundant in the south. Kerala is named, quite literally, after the banana trees that cover this state. Nowadays, stainless steel is widespread, especially in less banana-friendly climes like the U.S. If you visit Malaysia, Singapore, Indonesia, or Thailand, you’ll find â€œbanana leafâ€ restaurants and street stalls that serve a wide variety of food. There’s something about eating off a fresh, green leaf that makes the simplest sauce even more flavorful. 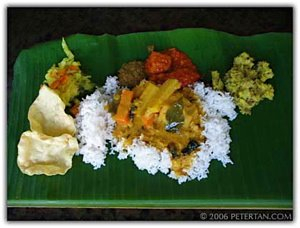 Although it seems casual, there are specific dictates in India to serving food on a banana leaf, especially for celebratory feasts or religious offerings. From alternating dry vegetables with gravies to the exact corner for placing a sweet palate teaser, the order of up to 20 different foods follows a circular pattern that incorporates health, religion and regional traditions. Udupi diners, in particular, take particular care in the placement of their food. At Komala Vilas, you won’t need to worry about this. You won’t even receive a menu, for that matter, but have no fear, for eating at restaurants like this is as simple as nodding your head. (You can even practice the Indian nod, that gentle sideways bobbing that marks a native of the subcontinent.) 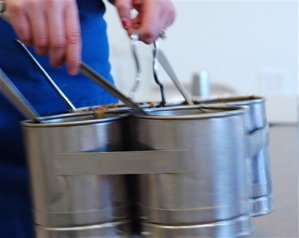 You’ll be given a large, metal plate, then immediately, servers will appear with large buckets of food. All you need to do is say yes to rice and its many accompaninents. One of the courses making its way around the dining room. As with dim sum and hotel brunch buffets, it’s all about the pacing. Even if you’re very hungry, you might want to pass on seconds of the first course. The food is so good and the servers so attentive that it’s very easy to accept more every time they come by. Spicy pickles and eating with your fingers slows you down a little, but not as much as you’d think. Finally, a note must be included about forkless food. As one of my hosts in Kerala told me, she couldn’t imagine eating with implements, as they would separate her from an entire sensory facet of food. The texture and temperature of vegetables in her hands were as important to her as our emphasis on visual aesthetics. At Komala Vilas, you’ll learn to get in touch with your food. Just as you would use chopsticks at a Chinese banquet, do follow your fellow diners at a South Indian restaurant. Remember that the right hand is for food, though an occasional nudge with your left fingers is unavoidable for most beginners. Cup your four fingers together like a spoon, and then use your thumb to slip each bite into your mouth. High society looks favorably on those who only wet their fingertips up to the first knuckle, but everyday eaters don’t mind a handful of flavor. Sambar is the everyday food of South India. If you’ve tasted any of the common chaat, such as idli or vada, then you most probably received some sambar alongside or over it. Made from a handful of lentils or mung bean simmered in a pot of water until they disintegrate into a smooth, creamy mixture, dal has infinite potential. The most common flavorings include golden turmeric, sour tamarind, earthy asafoetida, fragrant curry leaves, and popped mustard seeds. 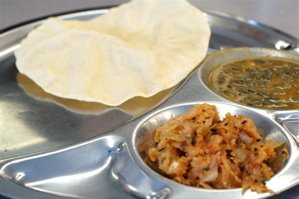 A ladleful of the sambar will appear at the top, left of your plate. To the right goes the vegetable of the day, such as drumstick, cabbage, potato, or caulifower. Once the rice comes, you can mix in as much of the sambar as you want. Large rounds of crisp pappadam will be offered, too. You can crush them into little bits to sprinkle over your rice, or you can just break off pieces occasionally to dip into the sambar. Or you can just eat them all before your rice even arrives. Your choice. The killer bucket that comes by regularly is the one filled with ghee. It’s an endless spring of buttery goodness, and for those who are ignoring their arteries, this golden richness makes everything taste better. Sambar, cabbage and pappadam waiting for a generous heap of rice. The second course is analogous to a soup course. Rasam refers to the tangy, thin broth that gets poured over your rice. A small amount of one or two vegetables adds some texture, while a generous finishing of fresh herbs and oil-sputtered spices adds complex layers of flavors. Again, mix it all up and then sweep the rice up to your lips. If you like your rice very wet, feel free to use the side of your hand to scoop and eat. By this time, you will also have been offered pickles. Maybe green mango, maybe zesty lime, or maybe a please-them-all mixed variety. I love pickles and have to curb my affinity for all things sour, or else the entire meal begins to taste like one spicy heap of pickle. The third and last savory course is a cooling mixture of rice and buttermilk or yogurt. Again, you can ask for ghee to enrich the rice. One of the most delicious versions I’ve had included some fresh lemon juice and more ghee than you want to know. Rice and curds is Indian comfort food at its best. I’d go in just for this course alone. 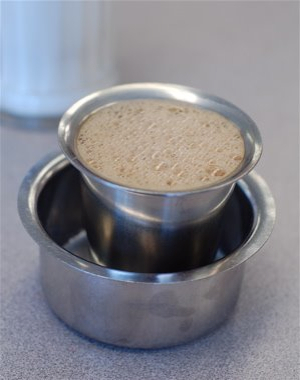 A tumbler of filter coffee, nestled in a deep, flared davarah, comes to the table frothy hot. Since I have Vietnamese blood in my viens, sipping Indian filter coffee comes as naturally to me as slurping pho. The metal filter, the 20-minute drip time, the bite of chicory mellowed with caramel sweetness — it’s culinary deja vu. You can order chai, but since we’re enjoying the flavors of South India, a tumbler of strong coffee is a must. Coffee became popular relatively recent in the subcontinent, but as the bean’s cultivation spread under the Raj across the foothills of the Western Ghats, it soon became a drink of choice in the surrounding states of Tamil Nadu, Karnataka, Kerala and Andra Pradesh. It’s the Peaberry that gives Madras filter coffee its distinctive flavor, but other dark roast varieties can also be used. Someone in the kitchen will pour the coffee back and forth between two containers to raise a lively forth of bubbles. The coffee should arrive so hot that you can’t touch the tumbler. Pour a little into the deep saucer and swirl it around to cool. Most like to sweeten their coffee a bit…or a lot. White sugar is the modern stand-in for jaggery, but if you ask nicely, you might be able to convince the server to bring you some deeply flavored palm sugar. Moist flakes of jaggery is to filter coffee what a drippy spoonful of sweetened, condensed milk is to Vietnamese coffee. It’s powerful stuff. There’s rarely need for a second cup, but then again, when has need ever stopped us from enjoyment? In the spirit of all-you-can-eat, I had triple servings of their lovely payasam. This soothing dessert — made from milk that’s been boiled, gently sweetened with sugar, thickened with tiny strands of vermicelli, flavored with cardamom, and sprinkled with almonds — is one of my favorites. You might think that you don’t have room, but it’s only a few spoonfuls (times three), just enough to finish a thoroughly satisfying meal.